British Midland Airways Limited (trading at various times throughout its history as British Midland, BMI British Midland, BMI or British Midland International) was an airline with its head office in Donington Hall in Castle Donington, close to East Midlands Airport, in the United Kingdom. The airline flew to destinations in Europe, the Middle East, Africa, North America and Central Asia from its operational base at London Heathrow Airport, where at its peak it held ca. 13% of all takeoff and landing slots and operated over 2,000 flights a week. BMI was a member of Star Alliance from 1 July 2000 until 20 April 2012. BMI was acquired from Lufthansa by International Airlines Group (IAG) on 20 April 2012, and was integrated into British Airways (BA) by 27 October 2012. BMI's subsidiaries Bmibaby and BMI Regional were also purchased, although IAG did not wish to retain either. BMI Regional was sold to Sector Aviation Holdings in May 2012 and continues to operate, whereas Bmibaby closed down in September 2012. British Midland Airways Limited held a Civil Aviation Authority (CAA) Type A Operating Licence, permitting it to carry passengers, cargo and mail on aircraft with 20 or more seats. 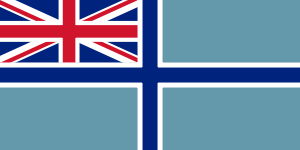 The airline dates back to 1938, when Captain Roy Harben established Air Schools Limited as a school for training pilots of the Royal Air Force Volunteer Reserve. Captain Harben had been approached by the Derby Corporation to run a new aerodrome under construction near Burnaston, which was planned to eventually become an airport. Sir Kingsley Wood, the Secretary of State for Air, officially opened the aerodrome as Derby Municipal Airport on 17 June 1939. Military flying training continued at the airport throughout the war. Air Schools Limited formed a parent company, Derby Aviation Limited, in 1946, and Harben died the following year of a heart attack. His wife remained the controlling shareholder of the business and asked E. W. Phillips, who had been involved in running the flying school with Captain Harben, to become the new managing director. The new parent company also incorporated Wolverhampton Aviation, based at Pendeford, which offered ad hoc charter and freight flights with de Havilland Dragon Rapides, as well as aircraft maintenance and brokerage. In 1953, Derby Aviation ceased flying training, following the award of a licence to operate scheduled flights from Burnaston and Wolverhampton to Jersey. Flights in each direction were required to land at Elmdon Airport in Birmingham to allow passengers to clear customs. The first flight was made on 18 July 1953, using a Dragon Rapide. 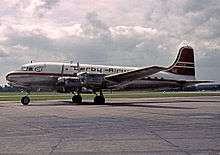 The following year, Wolverhampton Aviation was merged into Derby Aviation, and, in 1955, the company purchased its first Douglas DC-3, a converted former military transport. International services to Ostend commenced in 1956, and flights carrying holidaymakers from the UK to mainland Europe began as well. The company was also contracted by Rolls-Royce to transport aero engines to customers all over the world. In 1959, Derby Aviation formed Derby Airways as its airline business and introduced a new livery incorporating the new airline's name. Domestic scheduled flights within the United Kingdom began the same year. Douglas C-47 Dakota wearing British Midland's initial colour scheme in 1965. 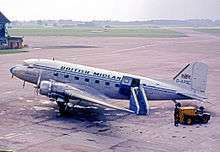 On 1 October 1964, after buying the Manchester Airport-based scheduled and charter airline Mercury Airlines, the company changed its name to British Midland Airways (BMA) and moved operations from Burnaston to the recently opened East Midlands Airport. The corporate colours of blue and white were adopted at that time, along with the first turboprop aircraft, a Handley Page Dart Herald. British Midland Airways Viscount 814 G-BAPF at Paris Orly in June 1981. Minster Assets, a London-based investment and banking group, acquired the airline in 1968, and in 1969 promoted former Mercury ground handling manager Michael Bishop to become the company's general manager. From this point, Bishop drove the company forward, with domestic and European expansion continuing apace. As a first step, in November 1969, BMA took over Autair's Heathrow–Teesside route, which marked the airline's Heathrow debut. In 1970, BMA entered the jet age with the introduction of three new BAC One-Eleven 500s, followed by an ex-Pan Am Boeing 707–321 in 1971. The former had been intended to be primarily used on European inclusive tour (IT) charters while the latter was to be mainly used on transatlantic "affinity group" charters. Also in 1970, BMA became the first British airline independent from government-owned corporations to employ UK-based, non-White cabin crew. British Midland Airways Boeing 707-338C G-BFLE at Paris Charles de Gaulle in 1982. Following his appointment as managing director in 1972, Bishop withdrew the One-Elevens from service, two of which were swapped for three Handley Page Dart Heralds while the third was subsequently leased to Court Line. As the early-model, high-time second-hand 707s commanded a low resale value, the airline decided to keep these aircraft and lease them out to other airlines on a wet lease basis, beginning in November 1972 with a £3.3 million, two-year contract to operate Sudan Airways' Blue Nile service between Khartoum and London. The decision to pull out of both the IT and "affinity group" markets was taken to reverse heavy losses BMA had incurred on these charter operations due to its lack of scale and lack of vertical integration with a tour operator, which put it at a commercial disadvantage vis-à-vis the competition, as well as uneconomical charter rates as a result of overcapacity. This resulted in BMA concentrating on regional, short-haul scheduled services and ad hoc charters using turboprops such as the Herald and Viscount as these were more economical than contemporary jets on short, thin routes. The success of the airline's wet lease operation resulted in an increase in the number of Boeing 707s allocated to this activity, including the addition of several later model 707-320B and -320C aircraft from 1976. All of these were leased to other operators, with none operating for BMA on scheduled or charter services until 1981. On 1 November 1974, BMA began operating between London Gatwick and Belfast, where it replaced the service previously operated by British Caledonian. London–Belfast was BMA's first UK domestic trunk route and the first all-year round route it served in [indirect] competition with British Airways (BA). BMA's Gatwick debut also made it the only airline at the time to operate scheduled services from all five contemporary London airports – Gatwick, Heathrow, Luton, Southend and Stansted. In January 1975, an agreement was reached for BMA to provide two Vickers Viscounts in Cyprus Airways livery to link Athens with Cyprus. A former WWII airfield at Larnaca was selected to serve the south of the island, following the Turkish invasion of Cyprus in 1974. The first flights departed Larnaca on 10 February 1975. 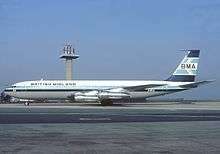 On 4 April 1975, the Daily Mail chartered a BMA Boeing 707 to assist the Project Vietnam Orphans and The Ockenden Venture charities in evacuating 150 orphaned children from Saigon during the Vietnam War. G-AZNA at Teesside Airport on 21 June 1987. On 1 September 1976, jets began gradually replacing the turboprop fleet on most of BMA's domestic and European services, when the airline's first Douglas DC-9 (a second-hand -15 leased from the manufacturer) replaced Viscounts on the Heathrow–Tesside route. In 1978, Minster Assets sought to sell the company. With the help of a Californian entrepreneur, Robert F. Beauchamp, Bishop raised £2.5 million to lead the management buy-out, and was appointed chairman as a result, afterwards stating "I had to borrow the money from an American citizen. Most venture capitalists want a return of 40% to make up for all their other failures and they want an exit strategy." That year, British Midland and British Airways agreed to swap some of their routes, resulting in BMA relinquishing its routes from Birmingham to Brussels and Frankfurt, and BA handing over its routes from Liverpool to London Heathrow, Belfast, Dublin, Jersey, the Isle of Man and Glasgow. Annual passenger numbers topped 1 million for the first time in 1979. On 31st March 1980, British Midland replaced British Airways on the Leeds Bradford to London Heathrow route, initially operating with their remaining Viscount 800 aircraft. Within a year or two these were replaced by the DC9 15, and following the extension of the runway at Leeds Bradford, the DC9 32 became the standard equipment on the route supplemented by the 15 series and at weekends the occasional Viscount, Fokker F27 or BAE ATP turbo prop. In 1986 however, British Midland leased a BAC1-11 400 (G-WLAD) from Airways International Cymru, and this aircraft was mainly used on the Heathrow route in lieu of the usual DC9s which returned in 1987. In the following years, British Midland increased its operations from Leeds Bradford, and introduced other routes including Glasgow, Paris CDG and Brussels. When the DC9s were phased out, the Boeing 737 200 became a regular on the Heathrow route, and later the 737 300, 400, and 500 were all operated prior to the arrival of the newly acquired Fokker 100, which again was supplemented on quieter rotations by the smaller Fokker 70. Eventually the Airbus A319 became the standard equipment to Heathrow, but busier rotations saw the larger A320 and occasional A321 too. At its peak, British Midland operated up to 6 flights each way to and from Heathrow from Leeds Bradford, the final late-evening flight being operated on a smaller Embraer 145 Regional Jet. In 2009 the airline dropped the route, which they had operated unbroken for 29 years. Also in 1982, BMA, together with British & Commonwealth (the owners of AirUK at the time), formed Manx Airlines, and the following year it purchased a 75% stake in Glasgow-based regional airline Loganair from The Royal Bank of Scotland. The British Midland logo introduced in 1985. In October 1984, the Boeing 707 fleet was withdrawn, having been used extensively on lease operations for other airlines across the world. In 1985, a new aircraft livery featuring a dark blue upper half and tail, with a light grey lower half separated by a thin, white stripe, was introduced. At this time, BMA was branded simply British Midland, and a new logo featuring a stylised red BM crowned with a white diamond shape appeared on aircraft tailfins. This livery subsequently featured a darker blue upper half and tail, with a deep grey lower half separated by two thin stripes, very dark blue at the top and red at the bottom. However, the logo on the aircraft's fins remained unchanged. The conclusion of the first fully liberalised bilateral air transport agreement in Europe between the United Kingdom and the Netherlands in 1985, as well as a legal technicality exempting the airline from the "London [Air] Traffic Distribution Rules" (a government policy that sought to compel all airlines that were planning to operate an international scheduled service to or from Heathrow for the first time to use Gatwick instead) as a result of having operated a Heathrow–Strasbourg scheduled service prior to this policy coming into effect on 1 April 1978, enabled BMA to compete directly with BA between Heathrow and Amsterdam from 29 June 1986. This resulted in BMA becoming the first private, independent airline to compete with then wholly government-owned BA on an international trunk route from Heathrow. The Diamond Club frequent flyer programme (FFP) launched on 1 October 1987, coinciding with the introduction of an enhanced business class style, single-class Diamond Service featuring a full meal and free onboard drinks service for all passengers, regardless of the fare paid, as well as airport lounges at the airline's major UK destinations. These service enhancements helped increase British Midland's market share on the main London–Scotland and London – Northern Ireland trunk routes to 30%. In addition, all aircraft in the fleet were named after diamonds, beginning with a DC-9 named The Tiffany Diamond, unveiled by Rosamond Monckton, the managing director of Tiffany's in London. In March 1987, Airlines of Britain Holdings (ABH) was formed to act as a holding company for British Midland Airways and British Midland Aviation Services. British Midland operated its final Viscount flight on 20 February 1988, 21 years after the airline had first operated the type. That year, British Midland also became the first to operate the British Aerospace (BAe) ATP for which it had been the launch customer. The BAe ATP was the airline's last turboprop type. In 1992, British Midland became the first airline to offer a vegetarian choice of in-flight meals on UK domestic flights and one of the first in Europe to do so on domestic services. The following year, the airline introduced Diamond EuroClass on its European routes, the first time it had offered a separate cabin for business travellers. Initially, Diamond EuroClass was competitively priced, with the highest fares being the same as rivals' published economy class fares. On 30 September 1996, British Midland began offering Diamond EuroClass on all its domestic routes, becoming the second airline in the UK after Jersey European Airways (which had pioneered business class on UK domestic routes in 1993) to offer a separate cabin for business travellers on domestic routes and the first to do so on domestic trunk routes from Heathrow. ABH became British Midland Plc in 1997, when it was de-merged as part of major corporate restructuring. Towards the end of the 1990s, British Midland switched its aircraft suppliers from Boeing and Fokker to Airbus and Embraer, selecting A319/320/321s and ERJ 135/145s to replace 737s and F70/100s. In July 1999, Bishop formally opened the British Midland Training Centre in Stockley Close. That year, Scandinavian Airlines System (SAS), a shareholder in British Midland since 1987, sold half its stake to Lufthansa followed by British Midland joining Star Alliance (in 2000). The BMI logo introduced in 2001. Following research that had established that people in the UK tended to confuse British Midland with the Midland Bank or British Airways and that many outside the UK could not relate to the term "Midland", it launched a new corporate identity in 2001, rebranding the airline as BMI British Midland (subsequently shortened to BMI). Aircraft received a new livery of royal blue, white and a fading Union flag on the tail, along with the new lower case BMI logotype. Also in 2001, BMI introduced the Airbus A330-200, its first widebodied aircraft type, into the fleet to enable it to serve the United States and other long-haul destinations. Bilateral restrictions implemented in the 1977 Bermuda II agreement meant the airline could neither fly its own aircraft to the US from its main base at Heathrow nor sell tickets on codeshare flights operated by Star Alliance partner United Airlines from the airport, as had been planned. Instead, it launched flights from Manchester to Washington Dulles and Chicago O'Hare in May and June 2001 respectively. Initially, the new A330s operated both routes; however, the Washington service was subsequently downgraded to a narrowbody operation using a Boeing 757-200 leased from Icelandair before being axed in 2005. The airline carried 7.5 million passengers during 2002. By 2005, the total had risen to 10.1 million, the third highest of any UK airline. In early 2006, the Association of European Airlines (AEA) reported a drop in passengers carried and load factors for BMI mainline and regional services (excluding Bmibaby) whilst reporting increased loads for other AEA members over the same period. Despite this drop in passenger numbers, the BMI Group reported a pre-tax profit of £10 million for the year ending 31 December 2005. Boeing 737-5Q8 G-BVZH landing at Edinburgh Airport on 5 May 2001. BMI operated a service to Mumbai from London Heathrow between May 2005 and October 2006, after the UK and India amended their bilateral air services agreement. Services to Riyadh followed, commencing on 1 September 2005, after British Airways ceased to serve Saudi Arabia earlier that year. BMI also launched a scheduled service to Moscow Domodedevo in co-operation with Transaero Airlines on 29 October 2006, which used a dedicated A320 aircraft (G-MIDO) with special seating for the service, including leather seats and a 40" seat pitch. In 2007 the airline launched non-stop services from its Heathrow hub to Cairo and Amman, raising the airline's profile in the Middle East significantly. BMI announced on 5 November 2008 that it would end all longhaul operations from Manchester Airport. The two Airbus A330 aircraft based there were moved to Heathrow. In February 2007, BMI bought British Mediterranean Airways (BMED), a British Airways franchise partner, and as a result gained access to new markets in Africa, the Middle East and Central Asia that were served by that carrier. As a condition of the sale, BMI sold BMED's Heathrow slots to British Airways for £30 million. BMED was fully integrated into BMI on 28 October 2007. The decision by the European Commission (EC) in 2008 to accord secondary slot trading by European airlines – the practice of buying and selling take-off and landing slots at congested airports – legal recognition resulted in BMI valuing its Heathrow slot holding at £770 million. Its first-time inclusion in BMI's 2007 annual report also resulted in a huge boost to the airline's net asset value, which stood at only £12 million the year before. It can therefore be argued that the EC's decision to legalise this practice made BMI an attractive takeover target for other Heathrow-based airlines and helped it avert bankruptcy. In November 2009, following the complete takeover of BMI by Lufthansa, the airline announced a restructuring of its mainline and regional operations in an effort to suspend loss-making routes and adjust capacity. The measures included a fleet reduction of nine aircraft from the mainline fleet (two of which were operated by BMI Regional) and the suspension of routes from London Heathrow to Amsterdam, Brussels, Tel Aviv, Kiev and Aleppo in 2010. Seasonal routes from London Heathrow to Palma and Venice were also discontinued. It was said that the restructuring could result in the loss of around 600 jobs – around 13% of the airline's workforce. On 12 January 2010, BMI announced that the number of daily flights between Dublin and London Heathrow would be reduced from 28 March from six to four due to the economic climate, which depressed consumer demand. This resulted in the closure of the Dublin base, which consisted of one plane and 33 cabin crew. In April 2010, the airline announced it would begin using the British Midland International name, whilst retaining the BMI logo and continuing to be known by those initials in the domestic market. The decision to revert to the old British Midland name and to spell out for the first time what the I in BMI was supposed to stand for was taken in response to research showing that for passengers based in the Middle East, who accounted for a significant number of the airline's premium bookings, BMI did not mean anything, and that these people preferred a name with the word "British" in it. Following increasing heavy losses that exceeded £100 million per year by 2012, BMI decided to no longer offer business class on domestic flights and introduce a number of new, longer range international scheduled services from Heathrow to ensure the most profitable use of its highly prized (and sought-after) slots at the severely capacity-constrained airport. This entailed aircraft downsizing (replacing Airbus mainline jets with Embraer regional jets), frequency reductions and route cutbacks on the airline's loss-making short-haul routes from the airport, including axing its by then heavily loss-making Heathrow–Glasgow route from 27 March 2011. The decision to exit the Heathrow–Glasgow market after almost 30 years' continuous operation was blamed on a big rise in the fees BAA levied on domestic passengers at Heathrow, which had resulted in unsustainable losses of £1 million per month. BMI's last-ever commercial flight using a "BD"-prefixed flight number touched down at London Heathrow on 27 October 2012. It was operated by Airbus A321-231 G-MEDF. 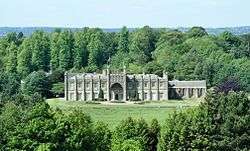 The airline had its head office at Donington Hall in Castle Donington in North West Leicestershire, near Derby. The airline's head office was previously at 78 Buckingham Gate in the City of Westminster, London (until 1982). 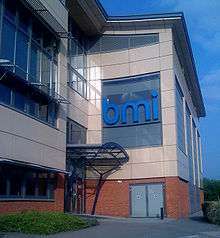 In 2011, BMI employed 527 staff at Donington Hall. In 2012, International Airlines Group announced that it may lay off up to 1,200 BMI employees, with proposed layoffs mainly from the head office. BMI also operated a flight training centre in the Stockley Close Industrial Estate in West Drayton, London Borough of Hillingdon, near London Heathrow Airport. The centre opened in 1999 and BMI had a 50-year lease on the property running from 25 March 1999 to 24 March 2049. In 1999, SAS sold half of its 40% stake in British Midland to Lufthansa, which was seeking a stronger position at London Heathrow, following which British Midland joined Star Alliance. At the time, British Midland chairman Sir Michael Bishop owned a 50% share of the company. Between 1999 and 2004, Lufthansa sought to sell some or all of its share in the airline. Virgin Atlantic hoped to buy the shares to then merge both airlines, as BMI was already Virgin's preferred feeder airline into Heathrow. Virgin argued that the merger would have brought together two airlines with combined ticket sales of more than £2 billion, forming a powerful force in the aviation industry. BMI was believed to have initiated the talks after it began losing money following the 11 September 2001 attacks. A merger would have strengthened Virgin Atlantic's base at Heathrow, where BMI had hundreds of highly valued take-off and landing slots, to increase the competition with British Airways. The two airlines combined would have had 17% of Heathrow slots against British Airways' 43%. Worried about the increased competition it would face if such a merger went ahead, British Airways considered the takeover of either BMI or Virgin Atlantic to stop the merger. British Airways concluded it would be easier to take over the financially weaker and less high-profile BMI. However, in 2004 talks of any merger of the three airlines ended. In late 2006, the airline again dismissed renewed speculation that Virgin Atlantic was preparing to make a bid to acquire full control of BMI, despite Sir Richard Branson repeating in a radio interview that such a merger would be a logical business move. In June 2007, SAS announced that it would sell its 20% stake to improve its own group profits. The airline commented that it was in early discussions with Lufthansa as a potential buyer. In October 2008 Lufthansa announced it would be taking over BMI by purchasing the 50% shareholding of Sir Michael Bishop to consolidate with the 30% share it already owned. The European antitrust body approved the takeover on 14 May 2009, allowing Lufthansa to become the majority stakeholder. Due to landing rights issues, the stake would be tentatively held by a Lufthansa-controlled but British-based company, LHBD Holding. Once new bilateral agreements were in place, Lufthansa would take direct control. In June 2009 it was announced that Lufthansa would buy the remaining stake in the airline from Bishop for less than originally agreed upon. Lufthansa announced in September 2011 that it planned to sell BMI following continued losses. Virgin Atlantic were mooted to be considering an offer; but in early November British Airways' parent company, International Airlines Group, announced an agreement in principle to purchase the airline. Virgin Atlantic confirmed on 12 December 2011 that it had also made an offer for BMI and signed an agreement in late November to allow them to conduct due diligence on the airline. The bid amount of around £50 million was half that offered by IAG; Virgin hoped that a quick sale due to fewer potential regulatory issues would convince Lufthansa to sell to Virgin. On 22 December 2011, IAG confirmed it had entered a contract to buy BMI from Lufthansa for £172.5 million. This would increase IAG's share of take-off and landing slots at Heathrow from 45% to 53%. Branson pledged to fight the deal, urging European competition authorities to intervene. The deal included the option for Lufthansa to sell BMI Regional and Bmibaby separately, as they are not required by IAG; the deal price would be lowered should Bmibaby not be sold in time. Under the agreed contract, Lufthansa would continue to be responsible for the BMI pension scheme after the sale was completed, although following rejection by the pension regulator, it is now to enter the Pension Protection Fund. On 30 March 2012, the sale of BMI was approved, conditional on giving up control of 14 daily slots at London Heathrow. Twelve of these were required to change hands completely while the remaining two could continue be part of the airline's slot portfolio but needed to be leased out. The twelve slots eventually went to Virgin Atlantic, who subsequently used them to set up its UK domestic operation operating out of BMI's old domestic base at Heathrow Terminal 1. BMI's ownership transferred to IAG at 23:59 on 19 April 2012. The airline left Star Alliance, but membership benefits for both Star Alliance and BMI's Diamond Club continued until 31 May 2012. The Diamond Club FFP continues for members with a BMI credit card, who earn points from their spend which can be converted to Avios, the currency of BA's FFP, Executive Club, on a 1:1 ratio. All other members were required to transfer to British Airways' Executive Club FFP. BMI Regional Embraer ERJ 145 G-RJXD landing at London Heathrow Airport in August 2007. In 2002, BMI set up a low-cost subsidiary, Bmibaby, using Boeing 737s which were displaced after BMI's fleet renewal programme favoured an all-Airbus fleet. Bmibaby flew routes between major and secondary airports around Europe from its bases at East Midlands Airport and Birmingham Airport until it was closed down by IAG in September 2012. The airline also operated a regional subsidiary named BMI Regional, headquartered in Aberdeen. An agreement to sell the airline to the Scottish-based consortium Sector Aviation Holdings was reached in May 2012 and was completed on 1 June 2012. BMI Regional continued to operate regional services for BMI until 27 October 2012, when it began operations as an independent airline. The key trends for BMI over its later years are shown below (figures as at year ending 31 December, and include Bmibaby): Financial data was reported in pounds sterling, and then in euros, because BMI was fully consolidated into the Lufthansa group of airlines on 1 July 2009. On flights from London Heathrow within the UK and to Ireland, economy class passengers had a selection of food items available for purchase; flexible economy class passengers were offered complimentary snacks and drinks. On European flights and services to Tripoli, Tunisia and Morocco, a two-class in-flight service was in place, with a hot three course meal for the business cabin and complimentary food and drinks served in the economy cabin. On mid-haul and the Freetown route, a two-class in-flight service was also in place. The business cabin was served a three course meal and was provided in-flight entertainment. A hot meal and complimentary drinks were served in the economy cabin. On A330 services to Saudi Arabia and Israel (until 2010), business, premium economy (only on board the flights to Israel) and economy cabins were available, each provided with complimentary drinks and food. Diamond Club was the frequent-flyer programme of BMI, with three membership levels: Blue, Silver and Gold. On sale to IAG, and being integrated into British Airways, Diamond Club members were offered a status match - BMI Gold to BA Gold, BMI Silver to BA Silver and BMI Blue to BA Blue (BA's base level). At the time of transfer, BA did not offer a lifetime status, so members who held BMI Lifetime Gold having qualified for 10 years in succession were only matched to BA Gold and were required to re-qualify to maintain that status level. British Midland Canadair C-4 G-ALHG at Manchester Airport on 29 August 1965. The Stockport Air Disaster: a Canadair C-4 aircraft owned by British Midland Airways (registration G-ALHG) operating a holiday charter flight crashed near the centre of Stockport, Greater Manchester, on 4 June 1967. This accident, the deadliest in the airline's history, killed 72 of the 84 on board and seriously injured the 12 survivors; it also resulted in withdrawal of the type from the airline's fleet. On 20 February 1969, a Vickers Viscount (registration G-AODG) was damaged beyond economic repair when it landed short of the runway at East Midlands Airport. There were no casualties. On 20 March 1969, a Vickers Viscount (registration G-AVJA) crashed on takeoff at Ringway Airport, Manchester. Three of the four crew members on board were killed. On 22 January 1970, a Vickers Viscount (registration G-AWXI) was damaged beyond economic repair at London Heathrow Airport when an engine caught fire on takeoff. A successful emergency landing was made at Heathrow. The Kegworth air disaster: on 8 January 1989, British Midland flight BD 092, a recently delivered Boeing 737-400 (registration G-OBME), crashed onto the embankment of the M1 motorway just short of the runway of East Midlands Airport, Leicestershire. Forty-seven of the 118 passengers lost their lives. On 24 August 2010, an Airbus A321-231 (registration G-MEDJ) en route from Khartoum to Beirut as flight BD996 suffered a serious electrical malfunction which caused the intermittent failure of the captain and co-pilot's electronic displays together with the uncommanded application of left rudder trim. The latter caused the aircraft to stray 20 nautical miles off course. The aircraft was cruising at 36,000 ft at the time, with both autopilot and autothrust engaged. The captain ultimately disengaged both and flew the aircraft manually, landing in Beirut without further mishap. Airbus indicated that an electrical power interruption had occurred which had caused a reset of the Flight Augmentation Computer (FAC). Such an event may cause a small incremental offset of the rudder trim, according to the aircraft manufacturer. The Air Accidents Investigations Board (AAIB) subsequently issued Safety Recommendation 2010-092, recommending that Airbus alert all operators of A320 series aircraft of the possibility that an electrical malfunction may not be clearly annunciated on the Electronic Centralised Aircraft Monitoring system (ECAM) and that such an event may lead to an uncommanded input of rudder trim. 1 2 Alex Brownsell (14 April 2010). "Bmi to re-introduce British Midland branding". Marketing Magazine. Retrieved 28 October 2012. 1 2 "BMI Formally Leaves Star Alliance". Star Alliance. 20 April 2012. Retrieved 25 April 2012. ↑ "Lufthansa and IAG sign purchase agreement for the sale of British Midland Ltd". LufthansaRTE. Frankfurt. 22 December 2011. Retrieved 22 December 2011. ↑ "Type A Operating Licence Holders". Civil Aviation Authority. Retrieved 28 October 2012. 1 2 3 4 5 6 7 8 9 10 11 Gunston, Bill (1988). Diamond Flight. London: Henry Melland Limited. ISBN 0907929184. 1 2 3 Clark, Andrew (18 May 2002). "A generation game". The Guardian. UK. Retrieved 2 November 2008. 1 2 3 4 "British Midland's double anniversary". Flightglobal/Archive. 6 May 1978. p. 1390. Retrieved 6 August 2013. ↑ "Independent reactions". Flightglobal/Archive. 14 November 1974. p. 668. Retrieved 4 June 2013. ↑ "British Midland changes course". Flightglobal/Archive. 22 August 1974. p. 202. Retrieved 5 June 2013. ↑ "BMA introduces DC-9". Flightglobal/Archive. 9 October 1976. p. 1065. Retrieved 14 August 2013. 1 2 3 "The Douglas DC-9 in the UK". AirTeamImages.com. 28 May 2011. Retrieved 6 August 2013. ↑ "BMA challenges BA and USA". Flightglobal/Archive. 23 July 1983. p. 179. Retrieved 6 August 2013. ↑ "Civil Aviation – HC Deb 22 June 1984 vol 62 cc595-658". Hansard 1803–2005. 22 June 1984. p. 615. Retrieved 6 August 2013. 1 2 "Snapshot – British Midland's Diamond Service (original title: Taking the Pledge)". Business Traveller / Archive / 2013 / May 2013 / Special reports. 30 April 2013. p. 11 (original, printed copy). Retrieved 9 August 2013. ↑ "History in Illustration: The Boeing 737–400 – 737–400 G-OBMM British Midland, Great Britain Delivered 11/18/97". www.cbrnp.com (Chris Banyai-Riepl). 2000. Retrieved 13 August 2013. ↑ "Select Committee on European Communities: Minutes of Evidence – Memorandum by British Midland Airways Ltd". www.parliament.co.uk (> Parliamentary business > MPs, Lords & offices). 1998. Retrieved 13 June 2013. ↑ "BMA pins future on Holland". Flightglobal/Archive. 14 June 1986. p. 8. Retrieved 13 June 2013. 1 2 "British Midland Offers Expanded Business Class Service to its Diamond EuroClass Passengers". PR Newswire Association LLC (via The Free Library). 26 September 1996. Retrieved 9 August 2013. ↑ "The nineties" (PDF). British Midland International. Retrieved 28 December 2011. 1 2 "Gone but not forgotten: British Midland". Key Publishing. February 2012. Retrieved 3 August 2013. ↑ "British Midland rebranded". BBC News Online. 1 February 2001. Retrieved 4 November 2012. ↑ "British Midland: Aiming for the US". BBC News Online. 1 February 2001. Retrieved 4 November 2012. ↑ "BMI attacks rivals' grip on key Atlantic routes". The Observer. 13 May 2001. Retrieved 7 August 2013. ↑ "BMI to axe Manchester-Washington". Flight International. 29 July 2005. Retrieved 7 August 2013. ↑ "BMI flies into the red". BBC News Online. 17 April 2003. Retrieved 4 November 2012. ↑ United Kingdom Civil Aviation Authority Passenger statistics for UK airlines, 2002 and 2005, table 0.1.6. ↑ "Association of European Airlines" (PDF). Retrieved 16 July 2012. ↑ "BMI profit up, passengers down". thisismoney.co.uk. This is Money. 4 April 2006. Retrieved 16 July 2012. ↑ "BMI will halt long-haul routes from Manchester". This is Derbyshire. 6 November 2008. Retrieved 1 January 2012. ↑ "UK bmi buys control of British Airways partner BMED". Reuters. 2 February 2007. Retrieved 1 January 2012. ↑ Brian Straus (16 May 2007). "Bmi's Bishop: 'No point' in selling Heathrow slots". Air Transport World. Retrieved 13 October 2012. ↑ "Bmi plans to integrate BMed by winter". RTÉ News. 6 March 2007. Retrieved 14 July 2013. ↑ "EU clears way for secondary slot trading". Flightglobal/Archive. 17 June 2008. Retrieved 6 July 2013. ↑ "BMI restructures mainline and BMI regional operations. 600 jobs to go". centreforaviation.com. CAPA – Centre for Aviation. 26 November 2009. Retrieved 16 July 2012. ↑ "Job cuts planned at airline BMI". BBC News Online. 25 November 2009. Retrieved 16 July 2012. ↑ "BMI to close Dublin cabin crew base". RTÉ News. 12 January 2010. Retrieved 1 January 2012. ↑ "Bmi to axe London–Glasgow route". Business Traveller. 31 January 2011. Retrieved 6 August 2013. ↑ "Contact us". British Midland International. Retrieved 13 June 2012. "Head Office Tel: +44 (0)1332 854000 Address: bmi Donington Hall Castle Donington Derby DE74 2SB"
↑ "BMI staff wait for news on future of jobs after deal to sell off airline". This is Derbyshire. 5 November 2011. Retrieved 1 January 2012. ↑ "Heavy job losses for Midlands as airline BMI taken over by British Airways". This is Derbyshire. 12 April 2012. Retrieved 11 October 2012. ↑ "British Midland Airways Limited Stockley Close, West Drayton Near Heathrow, London." KingSturge. Retrieved on 28 December 2011. ↑ "Virgin and BMI airlines in talks". BBC News Online. 22 May 2003. Retrieved 4 November 2012. ↑ "SAS seeks buyers for BMI holding". BBC News Online. 14 June 2007. Retrieved 16 July 2012. ↑ "BMI being taken over by Lufthansa". BBC News Online. 29 October 2008. Retrieved 16 July 2012. ↑ Arnott, Sarah (23 June 2009). "Lufthansa wins BMI sale battle with £115m to spare". The Independent. London. Retrieved 26 April 2010. ↑ "Lufthansa set to sell BMI". RTÉ. Dublin. 5 September 2011. Retrieved 4 November 2011. ↑ Lundgren, Lundgren (15 October 2011). "Virgin, Etihad Consider Lufthansa's BMI Partnership, FT Reports". Reuters. Retrieved 4 November 2011. ↑ "Lufthansa and IAG reach agreement in principle on the sale of British Midland Ltd." (Press release). Deutsche Lufthansa AG. 4 November 2011. Retrieved 4 November 2011. ↑ "Virgin and BA owner IAG fight to buy BMI from Lufthansa". BBC News Online. 12 December 2011. Retrieved 1 January 2012. ↑ Dan Milmo (22 December 2011). "BA owner IAG beats Virgin to buy bmi". The Guardian. London. Retrieved 1 January 2012. ↑ Alistair Osborne and Amy Wilson (22 December 2011). "British Airways owner IAG seals deal to buy BMI for £172.5m". The Telegraph. London. Retrieved 1 January 2012. ↑ "Binding Agreement for bmi purchase". International Airlines Group. 22 December 2011. Retrieved 1 January 2012. ↑ Siebert, Lucy. "Virgin Atlantic wins 12 Heathrow remedy slots". TTG Digital. Retrieved 19 November 2012. ↑ Douglas Fraser (30 March 2012). "Is British Airways giving up enough to buy BMI?". BBC News Online. Retrieved 3 April 2012. ↑ "A warm welcome to bmi Diamond Club members". British Airways. 28 September 2012. Retrieved 1 October 2012. ↑ "BMI Baby will fly for the final time today". ITV News. 9 September 2012. Retrieved 14 July 2013. ↑ "BMI Regional launches as independent operator". BBC News Online. 28 October 2012. Retrieved 14 July 2013. ↑ "Key Facts". BMI. Retrieved 11 December 2011. ↑ "Annual Report 2010" (PDF). Lufthansa. Retrieved 11 December 2011. ↑ "Flights With Other Airlines (Codeshare Flights)". British Midland Airways Ltd. Retrieved 11 October 2012. ↑ JL (4 April 2012). "British Airways / bmi to Launch Codeshare Service". Airline Route. Retrieved 16 July 2012. ↑ "G-INFO UK Register Database". Civil Aviation Authority. 31 December 2011. Retrieved 1 January 2012. ↑ "Diamond Club membership benefits". British Midland International. Retrieved 1 January 2012. ↑ "Accident description". Aviation Safety Network. Retrieved 3 September 2009. ↑ "Accident description". Aviation Safety Network. Retrieved 5 September 2009. ↑ "GINFO Registration History". Civil Aviation Authority. Retrieved 10 March 2011. ↑ "Flight Augmentation Computer (FAC)". Jane's. Retrieved 16 July 2012. ↑ "AAIB Special Bulletin: S2/2010" (PDF). Air Accidents Investigations Branch (AAIB). Retrieved 10 March 2011.